(c) Sergei Emelin & Alexei Pirozerski, 2001 - 2003. Welcome to our web site devoted to the study and experimental modeling of the ball lightning and other related fenomena! 1. S.E. Emelin. Commutation of lightning impuls by multiarc erosive radial-slotted discharge. // 5th Russian Conference on Atmospheric Electricity (RCAE-5), Vladimir, 21-26 September 2003, and 7th International Conference “Modern problems of electrophysics and electrohydrodynamics of liquids”, June 27-30, 2003, Saint-Petersburg, pp.94-97. Preprint physics/0304072 (19 Apr 2003). 2. S.E. Emelin. Conditions for non-stationary discharge initiation into "burning-through" mode. // 11th Russian Conference on Cold Nuclear Transmutation and Ball Lightning (RCCNT&BL –11), September 28 – October 5, 2002, Dagomys. Preprint physics/0306158 (21 Jun 2003). 3. A.L.Pirozerski. Spectral characteristics of long-living plasmoids arising from the erosive water surface discharge (abstract only) // 11th Russian Conference on Cold Nuclear Transmutation and Ball Lightning (RCCNT&BL –11), September 28 – October 5, 2002, Dagomys. 4. S.I.Stepanov, A.I.Egorov, G.D.Shabanov. Long-living luminous plasmoids, arising from electric discharge in the moist air (only in russian). // 5th Russian Conference on Atmospheric Electricity (RCAE-5), Vladimir, 21-26 September 2003. 5. S.E. Emelin and A.L. Pirozerski. Some effects of metastable substance observed in erosive discharges. // Theses of the III Russian Seminar "Modern means of plasma diagnostic and their application for control of materials and environment", Moscow, MEPHI, November 28-30, 2001. Preprint physics/0203034. Here is the russian version. Also see slides which was shown during our report. Emelin S.E., Pirozerski A.L., Egorov A.I., Stepanov S.I., Bychkov V.L. 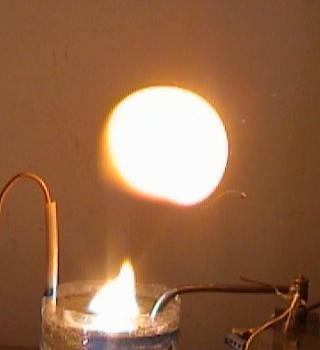 Ball lightning modeling via electrical discharge through the surface of a weak water solution. (MS Word2000, 200Kb, in russian) //The 10th Russian Conference on Cold Nuclear Transmutation and Ball Lightning (RCCNT&BL –10), September 29 – October 6, 2002, Dagomys, and The international conference "Abnormal effects in physics of high densities of energy (macro and microcosmos)", September 23-27, 2002, Yalta. III. Sections Our Publications, Experiments and Links have been updated. See slides which will be shown during our report "Long-living plasma formations arising from metal wires burning" on the International Conference "Abnormal effects in physics of high densities of energy (macro and microcosmos)", September 23-27, 2002, Yalta, and on the 10th Russian Conference on Cold Nuclear Transmutation and Ball Lightning (RCCNT&BL –10), September 29 – October 6, 2002, Dagomys. See also an abridged english version of the report. 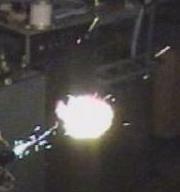 Read our article on long living plasma formations appearing at thin metal wires burning by the electric current. More come soon! Section, devoted to a new type of discharge - High Voltage Erosional Water Discharge, added in Experiments, with more than a hundred of images!